For the modern class of the same name, see Akizuki-class destroyer (2010). For the post-war destroyer class of the JMSDF, see Akizuki-class destroyer (1959). Akizuki on trial run off Miyazu Bay on 17 May 1942. The Akizuki-class destroyers (秋月型駆逐艦, Akizuki-gata Kuchikukan) was a class of destroyers of the Imperial Japanese Navy (IJN) built during World War II to complement the Kagerō class, primarily for the role of anti-aircraft screening for carrier battle groups. The class was also designed the Type-B Destroyer (乙型駆逐艦,, Otsu-gata Kuchikukan), from their plan name. During the war, the class proved to be a very capable multipurpose platform and was well regarded in the IJN. The Akizuki-class was built using the newly developed Type 98 dual-purpose guns in four twin mounts as its main battery. The four turrets were placed in pairs fore and aft, with the middle positions located in a superfiring position. Unlike the larger weapons mounted by the preceding Kagerō-class, there were true dual-purpose guns with a high reliability, rate of fire and range. It was intended that each vessel be fitted with two Type 94 fire-control directors capable of targeting high-angle targets, to be mounted above the bridge and in a small deckhouse near the aft mount: however, due to production shortages, the last five vessels in the class never received their second Type 94, and eventually it was removed from the aft position an all ships, and that location used for a triple Type 96 AA gun mount. Two twin-mount Type 96s were also located amidships. Before the design was finalized, the Imperial Japanese Navy General Staff Office intervened, and insisted on the addition of a centerline-mounted Type 92 quadruple torpedo launcher with reloads, firing the Type 93 "Long Lance" torpedo. The class also carried two Type 94 depth charge projectors and 54 depth charges. These were increased to 72 depth charges for some of the later production vessels. The hull was 50 feet longer, and the displacement was 700 tons larger than the preceding Kagerō-class. Propulsion was by two Kampon geared steam turbines, each driving a single propeller shaft, using steam provided by three Kampon water-tube boilers. The turbines were rated at a total of 52,000 shaft horsepower (39,000 kW) for a design speed of 33 knots (61 km/h; 38 mph). Unlike previous Japanese destroyer designs, there were two separate engine and boiler rooms for increased survivability in battle. The Akizuki-class also were among the first Japanese destroyers equipped with the Type 21 air-search radar, which was mounted on all but the Akizuki and Teruzuki . Ships surviving to 1944 also received the Type 13 radar, and the last five vessels in the class had the Type 21 replaced by the new Type 22 radar, and an additional Type 13 added to their EW suite. Six of this class were authorized in 1939 Maru 4 Programme and another ten in the 1941 Maru Kyū Programme. Only one of the last four was even laid down before all were canceled. Later units of the Fuyutsuki and Michitsuki subclasses were completed to a simplified hull shape to decrease production time. Another slightly larger improved group of 16 ships was authorized in the 1942 Modified 5th Naval Armaments Supplement Programme with another 22 ships planned to follow. All of these were canceled before construction started. Only six vessels survived the war, and four were used for war reparations. Project number F51. General production type of the Akizuki class. Seven vessels were built under the Maru 4 Programme (Ship # 104-109) and the Maru Kyū Programme (Ship # 360). 104 Akizuki (秋月) Maizuru Naval Arsenal 30 June 1940 2 July 1941 11 June 1942 Sunk during the Battle of Cape Engaño on 25 October 1944. Removed from navy list on 10 December 1944. 105 Teruzuki (照月) Mitsubishi-Nagasaki Shipyard 13 November 1940 21 November 1941 31 August 1942 Heavily damaged by USS PT-37 and PT-40 off Savo Island on 11 December 1942. Scuttled on 12 December 1942. Removed from navy list on 20 January 1943. 106 Suzutsuki (涼月) Mitsubishi-Nagasaki Shipyard 15 March 1941 3 March 1942 29 December 1942 Survived war at Sasebo. Decommissioned on 20 November 1945. Converted to breakwater at Kitakyūshū in July 1948. 107 Hatsuzuki (初月) Maizuru Naval Arsenal 25 July 1941 3 April 1942 29 December 1942 Sunk during the Battle of Cape Engaño on 25 October 1944. Removed from navy list on 10 December 1944. 108 Niizuki (新月) Mitsubishi-Nagasaki Shipyard 8 December 1941 29 June 1942 31 March 1943 Sunk during the Battle of Kula Gulf on 6 July 1943. Removed from navy list on 10 September 1943. 109 Wakatsuki (若月) Mitsubishi-Nagasaki Shipyard 9 March 1942 24 November 1942 31 May 1943 Sunk during the Battle of Ormoc Bay on 11 November 1944. Removed from navy list on 10 January 1945. 360 Shimotsuki (霜月) Mitsubishi-Nagasaki Shipyard 6 July 1942 7 April 1943 31 March 1944 Sunk by USS Cavalla off Anambas Islands 02°21′N 107°20′E﻿ / ﻿2.350°N 107.333°E﻿ / 2.350; 107.333 on 25 November 1944. Removed from navy list on 10 January 1945. 361 Fuyutsuki (冬月) Maizuru Naval Arsenal 8 May 1943 20 January 1944 25 May 1944 Survived war at Kitakyūshū. Decommissioned on 20 November 1945. Converted to breakwater at Kitakyūshū in July 1948. 362 Harutsuki (春月) Sasebo Naval Arsenal 23 December 1943 3 August 1944 28 December 1944 Survived war at Kure. Decommissioned on 5 October 1945. Surrendered to Soviet Union on 28 August 1947 and renamed Vnezapniy (Внезапный, lit. "sudden"). 363 Yoizuki (宵月) Uraga Dock Company 25 August 1943 25 September 1944 31 January 1945 Survived war at Nōmi. Decommissioned on 5 October 1945. Surrendered to Republic of China on 29 August 1947 and renamed Fen Yang. Scrapped in 1963. 364 Natsuzuki (夏月) Sasebo Naval Arsenal 1 May 1944 2 December 1944 8 April 1945 Survived war at Kitakyūshū. Decommissioned on 5 October 1945. Surrendered to United Kingdom on 25 August 1947. Sold and scrapped at Uraga in September 1947-March 1948. Project number F53. Final production model of the Akizuki class. Simplified more than Fuyutsuki class. Converted 5 vessels from the Maru Kyū Programme (Ship # 365-369) and 16 vessels from the Maru 5 Programme (Ship #770-785 were re-planned to #5061-5076). However, only 1 vessel was completed. 365 Michitsuki (満月) Sasebo Naval Arsenal 3 January 1945 16% complete, construction stopped on 17 April 1945. Scrapped on 28 February 1948. 366 Hanazuki (花月) Maizuru Naval Arsenal 10 February 1944 10 October 1944 26 December 1944 Survived war at western Inland Sea. Decommissioned on 5 October 1945. Surrendered to United States on 29 August 1947 and renamed DD-934. Sunk as target off the Gotō Islands on 3 February 1948. 367 Kiyotsuki (清月) Maizuru Naval Arsenal Cancelled on 14 December 1944. Hae (南風) Cancelled on 9 June 1944. ^ a b Whitley, M J (2000). Destroyers of World War Two: An International Encyclopedia. London: Arms and Armour Press. p. 204. ISBN 1-85409-521-8. ^ a b c d e f Stille, Mark (2013). Imperial Japanese Navy Destroyers 1919–45 (2). Oxford, UK: Osprey Publishing. p. 30-38. ISBN 978 1 84908 987 6. ^ 1 October 1943, Administrative order No. 235, Named one destroyer, two submarines, one coast defence ship, two minesweepers, and one submarine chaser., Minister's Secretariat, Ministry of the Navy. ^ National Archives of Japan, Reference code: C12070120400, October (1) p.1. ^ 5 February 1945, Administrative order No. 22, Named four destroyers, one submarine, and six coast defence ships., Minister's Secretariat, Ministry of the Navy. ^ National Archives of Japan, Reference code: C12070510100, February (1) p.44. ^ Pike, John (27 April 2005). "globalsecurity.org". Archived from the original on 19 November 2007. Retrieved 23 November 2007. "Japan Center for Asian Historical Records". , National Archives of Japan. Reference code: C12070120400, October (1). Reference code: C12070510100, February (1). 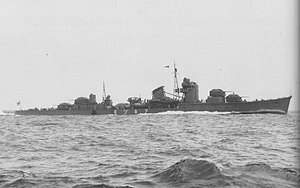 Wikimedia Commons has media related to Akizuki class destroyers (1942). This page was last edited on 27 January 2019, at 20:06 (UTC).